in a rush, we can save you money by only shipping part of your order faster. Our goal is to show you how to spend a $1 and make $10 - and if you focus on your clients needs and communicate enticing offers versus focusing on your company, you will see a much higher response. The owner of WorldsCheapestPrinting.com has been engaged in Marketing his entire life and is happy to share all the good ideas he has had the opportunity of seeing and learning. To schedule a FREE Marketing call, please click here to submit a brief Marketing Questionairre and to schedule a return call.schedule a FREE Marketing call, please click here to submit a brief Marketing Questionairre and to schedule a return call. At Worlds Cheapest Printing we have done our best to make ordering online very easy and straight forward. Throughout the check out process you will know what step you are on and what steps remains. >> Choose all the products you would like to add to your shopping cart. You will be shown a summary of all products in your cart before advancing to the next step. If you have something in your cart that you need to change, please just delete the item from the cart and then re-add the correct version of the product you had to delete. >> Here is where you will give a unique name to each product (i.e. - Bob Johnson Business Cards or Holiday Direct Mail Piece, Ect). You can also enter in order notes-But this would NOT include graphic design notes. You will be prompted for Graphic Notes at the final step. >> Here is where you can either login in to an existing account and/or set up your account details. Here is where you will enter in contact & shipping info along with creating a password for your account. >> You can pay with Visa, Mastercard, Discover & American Express. No Charges are made until you approve the artwork proof that will be sent to you after your order is placed. The highest online security is used with hosting being done on GoDaddy using their highest encrypted security format. >> Here is where discount, coupon or offer codes are entered in. The discount will show on the final invoice that follows this step. >> Please check this summary to make sure everything is exactly as you want including coating type, size, paper stock to assure you are ordering the correct piece. Your CC is not charged upon submitting the order but will be as soon as you approve your artwork. >> Upload Artwork Files - if unsure on what is acceptable, click on File Setup tab above to view what all is acceptable. You will be emailed a proof to verify your upload to assure the correct files go to print. >> Here is where you can submit your graphic instruction and upload images or scans of previous cards. You can also include links to web graphics or websites that have images or a design you are looking for. The more initial instruction you can provide up front will assure a first version that is close to what you are seeking. All graphic art instruction and comments are handled through the online graphic communication system - Sorry, graphic instruction is taken by phone - which is one reason the graphic art charges at Worlds Cheapest Printing are a fraction of what other printing companies and graphic artist charge. >> With all orders a proof is sent to assure the correct images are printed - we do this as to be absolutely sure there are no errors on either side - as many clients have sent in what they considered print ready artwork and then will catch an error they made on their initial submission. >> With graphic services, proofs are posted until you approve the final files - it typically takes 2 to 4 proofs to reach an acceptable format. Microsoft Word - IS NOT a format that can be converted to print quality -- If requested graphic services, this file format can be used as a guideline for graphic layout and design services. File Sizes - Please add .125 to all files sizes � i.e. a business card would be 3.625x2.125, a 4x6 postcard would be 4.125 x 6.215. Please keep anything important .25 from the edge of all designs as card cuts will vary. How does SuperCheapCards.com have pricing that is cheaper than black and white? >>>> We use the most sophisticated offset presses combined with doing everything in huge gang runs allow SuperCheapCards.com to offer the highest quality full color printing at extremely low prices. >>> When viewing proofs on your monitor, please keep in mind that colors you are seeing are displayed in RGB color - so it will not necessarily accurately show your piece in how it will reproduce color wise. Even if you view your piece on two different monitors you will typically see a difference in how your proof appears. Proof Resolution - proofs you view are at 150 DPI so clarity will be only 50% of actual reproduction. 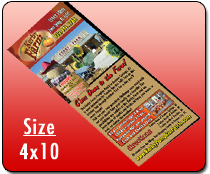 If you have a sensitive feature on your piece, you can request a 300 DPI proof. >> All efforts are made to match files as closely as possible but with Gang Runs colors shades can and will vary. To minimize color shifts, choose vibrant & distinct colors. Shades that tend to shift are dark greens, dark blues, dark purples, and any other shades that closely border the next color in the spectrum. >> Color Variance on the same card printed at two different times - this can also happen as every run is influenced by the predominant colors on the run so if you reorder a card a second time is it possible for the shades to vary from the first run. >> If there is a color shift on a card the only one that will know is you - your prospect and clients will have no idea that colors shifted or the fact your second order of business cards, postcards or whatever you ordered is not exactly the same shade as the first version. >> The only way to guarantee color matching is to do PMS color matching which would triple the cost of any order - as special inks are actually purchased to match the exact colors used in the artwork file. Over many years of Gang Run printing, clients have found the advantages of very low full color reproduction with a few limitations far out weighs trying to have colors match precisely. If this is a important issue, one other way to reduce the cost of color matching is to purchase enough printing to fill an entire run. Please feel free to call Corey at 512-573-1977 to discuss solutions that will work best for your company and budget. >> All efforts are made to cut everything exact but cuts can and will vary. Cuts Can vary up to 3/16". DESIGN TIP - If you are doing your own graphic design, to minimize the effect of card cuts that can vary, avoid using any borders around the edge of the card - if you want to use a border, make the border 1/4" thick all the way around. The key is to keep anything important that you would not want cut into 1/4" from the edge of your designs. >> For as little as $59.00 you can have a top flight graphic artist create a piece that will help you generate more interested prospects that lead to sales. The analogy we give to a regular business card versus one focused on recombining an effective Marketing Card is the same concept of someone buys a drill - you do not buy a drill because you want a drill, you buy a drill because you want a hole. At Worlds Cheapest Printing, we know you aren't desiring to purchase paper & ink per say -moreover, you really are investing in paper & ink to generate more sales & profits. Our primary goal is to find solutions that cost you a $1.00 and generated $10.00 in revenue (of course, every business presents different marketing challenges, markets & margins). >> If you have purchased graphic art services and would like to receive a FREE MARKETING ADVICE CALL - please click here and fill out the brief marketing questionnairre to schedule a return call from the owner of Worlds Cheapest Printing. >> Worlds Cheapest Printing is always happy to give advice and communicate strategies that have been proven effective by our other clients, but Worlds Cheapest Printing graphic design services are at 100% at our clients direction, we don't take charge of the design process in regards to marketing ideas & strategy, but only follow your exact direction in that regard. The graphic artists at Worlds Cheapest Printing will do a good job of logically laying out what info you have provided in formats that have been proven popular but it will remain your responsibility to provide that final guidance in regard to marketing, offers & strategy. Below are a number of tips to keep in mind when putting together your design notes. >> Remember that your prospects only care about their wants, needs and/or perceived needs (that you can create with effective marketing). The biggest mistake we see here at Worlds Cheapest Printing is company centered marketing materials that are very EGO driven. Your prospects will not care much about your company until you have first convinced them they have a need that they must fullfill. One key is using very compelling headlines that communicates the key reason on why your propect would be enticed to use your service. Using FREE in a headline is also very effective - and the key to using FREE does not mean giving something away for FREE per say, but to just give the perception they are receiving something for FREE that has a lot of high perceived value. 90% of the effectiveness to any marketing piece will rest with the top 1/3rd of your card and headlines used. A good way to think of how you can get your clients attention - look at the covers of magazine at grocery store check out counters - such as the National Inquirer, The Globe and other magazines - these publications spend 90% of their time working on the cover as they realize if you don't pick up the magazine from the check out lane, nothing printed inside will matter at all.